organizations in the Flower Mound area. 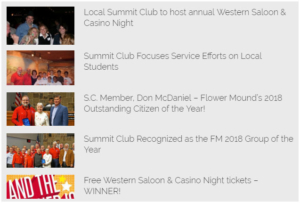 The Summit Club has defined sponsorship opportunities. Please see these sponsorships at the Western Saloon & Casino Night page. If you have other creative ways that you would like to help support the Summit Club, please fill out and submit the form below. Your ideas on ways to help sponsor the Summit Club.